Nothing encapsulates the Isipani philosophy better than the company motto: "Teamwork builds quality". Add to that a more than 55 year tradition of ongoing training and skills development, a commitment to the safety and well-being of all our workers and an entrenched management participation policy, and you’ll understand why we consider our greatest asset to be our people. We believe we are the employer–of–choice in the Western Cape. It’s not just the personal growth and emotional well–being of our workforce that is of concern to us. Physical safety is paramount. Employees need to be reminded that a construction site can potentially be a dangerous working environment. We need to understand the importance of health and safety risks and strive to implement measures to reduce, or even better, avoid these risks. Stringent safety and loss control measures are enforced across all our building sites, and equipment and scaffolding is stringently inspected on a regular basis. A full–time OHS Manager and our own Safety Management System, ensures that we continue to meet the Occupational Health Safety Act & construction regulations. Our safety officers valued input, training and inspections, not only helps ensure a safer working environment, but also gives peace-of-mind and the necessary guidance to our clients and professional team. A clean and tidy construction site not only instils a sense of pride in the work on hand, but also helps to create a safer environment in which to work. Therefore we believe a neat site is a safe site. Site managers are also reminded that a tidy, well organised site, is a good marketing tool. The company always employs experienced people on site; people who have enough experience to identify and report any possible safety risks. All new workers undergo an induction programme to increase safety awareness that is site specific. All employees are required to wear prescribed safety gear and are required to undergo regular training in safety procedures. The company’s high regard for occupational health & safety is reflected in the large number of safety awards it has received over the years. Ongoing training has always been a corner stone of our commitment to quality and to the people who will ensure the continued growth and success of our company into the future. Effective training contributes to both personal growth and quality workmanship. It helps attract like–minded employees and keeps our quality–conscious clients returning. In-house training done by the OHS Manager & regular revisions, are made to keep employees up to date with requirements as stipulated by law. 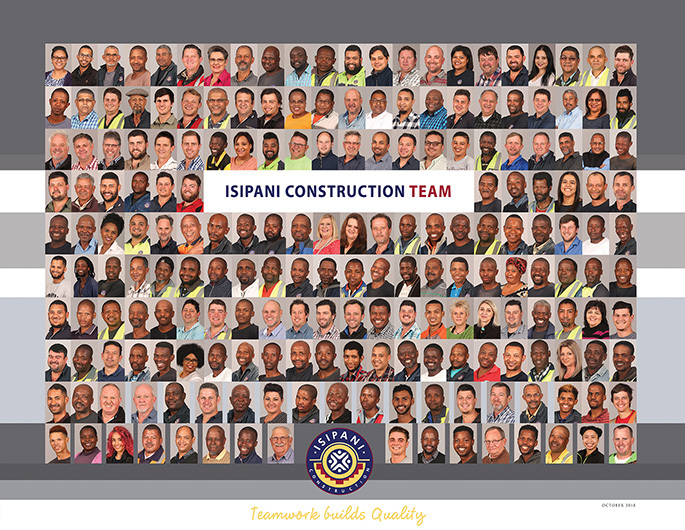 Today, Isipani Construction (Pty) Ltd, provides extensive in-house training to Site Agents, Project Managers, Foremen and Artisans through on–the–job training and mentorship programmes. In addition, employees are also encouraged to attend courses provided by the Boland College and the MBA in Paarl and Rondebosch. Our office and senior site personnel regularly attend seminars and other courses to familiarize themselves with current trends. These include computer, financial, Green Building, tax and contract law courses. We also employ Technikon students as junior Supervisors and - Quantity Surveyors.